As a mom of one who loves to look stylish on a budget, I’ve come up with a number of clothes shopping tips and tricks. Kids grow like weeds, so to avoid having to remortgage your house, you need to know how to shop smart for clothes. But this isn’t just about kids clothes. For kids clothes, we all want to know how to buy a lot of clothes with little money. But as an adult who (thankfully!) doesn’t grow out of their clothes every month, you want to know smart shopping strategies that will help you figure out things like how to dress well without spending a lot of money and how to get designer clothes for cheap. Friends don’t let friends pay full price for clothes, so here’s how to look fashionable on a budget. When it comes to looking fashionable on a budget, classic, high-quality pieces will always win out over cheap, fast fashion. A cheaply made, poor quality top that costs $15 but only lasts three washes before it goes out of shape is going to cost you more in the long-run compared to a high-quality, name-brand top that might cost more initially but lasts for multiple seasons. Of course, when you’re on a budget, you don’t want to shell out $60 for a high-quality top, so let’s move onto our next point. Would you rather spend $300 on a designer jacket and have an empty wallet, or would you rather spend $20 on a designer jacket that looks just as good, but have $280 in your wallet? Years ago, I was aversive to the idea of shopping in thrift stores. However, after being introduced to thrift shopping by my best friend (a major thrift store fan) I fell in love with thrifting. So if you want to dress well without spending a lot of money, thrift stores are the way to go! Thrift stores can be hit and miss, but if you manage to find a good one, you’ll have a veritable gold-mine of high quality designer clothes at bargain prices. These types of thrift stores are a budget fashionista’s dream! I recommend driving to thrift stores that are in or near more expensive suburbs or in major cities. Just recently, my sister found a pair of genuine Louboutins for $20 at a thrift store located in a suburb where you can’t buy a house for less than $1 million. In addition to shopping at regular bricks and mortar thrift stores, I also regularly buy items from my favorite online thrift store, ThredUp. ThredUp also has a clearance section with clothes starting as low as $0.99. Want to get a free item of clothing from ThredUp? Click here to create an account and you’ll get $10 credit in your account! For online shopping, Ebates is the best way to save money. If you’re unfamiliar with Ebates, the concept is simple. Then whenever you’re going to do any online shopping, first go to the Ebates site. Find the retailer you want to shop with and click on the link to their site. Ebates will track your purchases and give you a percentage of the total purchase price back in cash – too easy! Every 3 months Ebates will send you a “Big Fat Check” in the mail or deposit the money into your Paypal account. Ebates also has tons of coupon codes which will save you even more money. Here’s the link to join and get your bonus $10. Paribus is a free app that works on your behalf to make sure you’re always getting the best deal on items you purchase online. When you have Paribus installed, they will scan all the receipts in your inbox and then check to make sure that the price hasn’t dropped. If Paribus detects a price drop, then they will act on your behalf to get you a refund of the difference. Since their inception, Paribus has helped shoppers save millions of dollars. Click here to read my full Paribus review. If you’re a regular reader here, you’re probably aware of my love of Amazon. I get all of my Lularoe style leggings from Amazon for less than half the price (the quality, price and prints are awesome) and I almost always buy my books from Amazon, too. Amazon has a huge variety of cheap, cute clothes (so much so that it can be difficult to wade through them all.) But whenever I need a specific item of clothing, I’ll pretty much always check Amazon to see what I can find. Retailers love giving coupons and special discount codes to their newsletter subscribers, so make sure you sign up for the mailing list of all your favorite stores. If you use a gmail account the newsletters should go straight to your promotions tab, meaning they won’t clutter up your inbox. Otherwise, just sign up for a free hotmail account and use that email address solely for retailers newsletters. Some of my favorite newsletters include Pink (I regularly get a coupon for a free pair of underwear,) Old Navy, Target, Belk, JC Penney and Macy’s, but virtually all stores will send out coupons regularly. Retailers always deeply discount their end-of-season clothes, making it a great time to get some amazing bargains. Stores like Old Navy usually have a large clearance rack with items discounted up to 90%. My most recent end-of-season bargain was a sweater I got for 90 cents! Additionally, whenever I see end-of-season sales on kids clothes, I will buy items for my son to grow into. I have tons of clothes stored away for my son in sizes 2 and 3 (he’s currently in 18 months) that I got at a huge discount. I’m also a huge fan of stores like TJ Maxx and Ross, especially for workout clothes. In fact, I never buy gym clothes from anywhere else now. I recently got a Nike tank from TJ Maxx for $15.99 that retails for $45 and a pair of running shorts for $9.99 that retail for $39.99! Some stores always seem to have a sale going on (which makes me think, is it reeeeally a sale when it’s always “on sale”…) but other stores have seasonal sales where they offer huge discounts. Victoria’s Secret has their semi-annual sale and large department stores also have big seasonal sales where you can get clothes for up to 75% off. Belk is one of my favorite department stores for sales – I’ve gotten items for 75% off before. When I first discovered outlet malls, I had to check my pulse for a second – I thought I’d died and gone to heaven. Amazing deals can be found at outlet malls, but there are a few caveats. First of all, try not to get swept away with buying ALL.THE.THINGS just because they’re cheap. It’s not a bargain if you don’t need it. Also, be aware that a lot of the items you see at outlet malls are there because they’re last seasons stock or because they’re ill-fitting, lower quality. I don’t care at all whether it’s last seasons stock (I wear my clothes for more than one season anyway!) but I always make sure to try everything on before I purchase it to make sure it’s not in the outlet mall because it’s so horrible that nobody wanted to buy it! My husband is in the military which means that every year we attend a military ball. As I’m sure you’re aware, formal dresses can be incredibly expensive. A couple of years, I’ve managed to score and find a formal dress at Ross for around $17-$18, but the years where I haven’t been so lucky, I’ve borrowed a dress from a friend. When it comes to special occasion clothes that you’re likely to wear only once, then ask around to see if there are any family members or friends who wouldn’t mind lending you the item for a night. Dyeing your clothes can be a great way to revitalize an item and avoid having to make another purchase. I had a pair of skinny black jeans that I absolutely loved. I wore them all the time in winter and after a year or so, they really started to fade, going from black to a kind of dark greyish color. Besides being slightly faded, the jeans were in absolutely perfect condition so I really didn’t feel that it was necessary to buy another pair. Instead, I used this clothes dye and dyed them black again. They looked as good as new! A lot of money can be saved by avoiding going to the mall “just to browse.” Because if we’re honest, nine times out of ten “just browsing” turns in “impulse buying.” And “impulse buying” usually means buying things you don’t need at prices that you probably can’t really afford. When it comes to saving money on kid’s clothes, a lot of the same tactics apply. For that reason, when it comes to kids clothes, quantity is more important than quality. Play clothes are the clothes that they wear every day. These are the clothes that you’re fine with them destroying in the dirt outside, getting finger paint all over or staining them with spaghetti sauce. Dress clothes are their “special occasion” clothes, for things like going out to dinner, a birthday party, the movies, etc. My favorite place to shop for nicer kid’s clothes on a budget is TJ Maxx, particularly the clearance section. TJ Maxx drastically marks down their end-of-season clothes, which is a great time to stock up on designer clothes at bargain prices. At one of my TJ Maxx end-of-season hauls, I spent $50 and got my son 4 pairs of Nike sweatpants, 2 Nike hoodies, 1 Ralph Lauren hoodie, 2 long-sleeved Ralph Lauren tees, 1 Hurley hoodie and a six pack of Jordan socks. ThredUp is another good source to look for bargain-priced kid’s clothes. 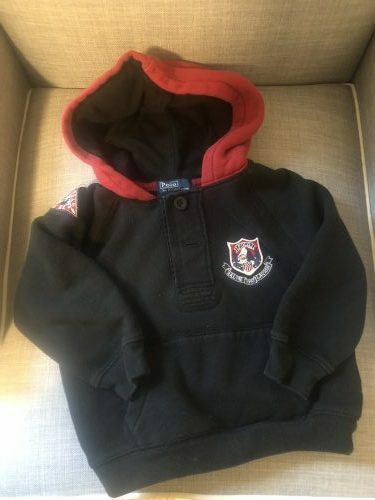 I recently got this cute Ralph Laruen hoodie for my son for just a few dollars (again, in the clearance section.) Click here to get a free $10 to spend at Thredup. Those are the 14 smart shopping strategies that I use to look fashionable on a budget. And honestly, I’ve been bargain shopping for so long now that I don’t think I could bring myself to pay full price anymore. What about you? Do you have any other methods to save money on clothes and never pay retail? Let me know in the comments!